Goals, objectives, and projects require habits. On Day 9, we took all of our previous work and selected no more than four goals or outcomes to focus on. These goals are the ones that, if achieved, will have the greatest impact in our lives this year. But for goals to be effective, they have to be supported by habits and practices. I want to take a quick aside to note that if one of your goals is the completion of a project, ‘habits’ might not be the word for you. Habits or practices: These are activities that we intend to do consistently over time in order to achieve a desired result. Running every morning is a habit. Turning your phone off after you get home from work is a habit. Journaling is a habit. Having date nights with your spouse is a habit or practice. Steps: If one of your goals is more like a project (one of mine is to tile my children’s bathroom by March 1), then you should identify the steps it would take to get you from beginning to completion. It’s vital to know the next simplest thing to do in order to get closer to your goal. The main thing: Identify what you can do to drive you to accomplishing your goals. Make them easy: Unless you have a goal that is already supported by current habits that you need to intensify, make your habits or steps simple. This dovetails with the ‘Realistic’ piece of the SMART goal format. Decide on habits that you are sure you can do. You can always stretch yourself later. Pick the familiar: You’ve tried this before. You know what works. Pick the habit that works. Model someone else’s success: If you’ve struggled to achieve the result you’re looking for, you might know someone who has been successful. Ask her how she did it. Read the book he wrote. Take on the practices you know she holds. Google or Youtube it: This option is especially helpful if you need steps for a project and you simply don’t know where to start (see also my tile project). Take advantage of the web. Youtube was instrumental in my completing my first tile project. Select keystone habits: in an effort to keep it simple, consider keeping your habits few but full of impact. Identify a habit that would lead easily to other habits. For example, running every morning might lead to drinking more water and eating more consciously. As far as the number of habits, that depends on what you’re trying to accomplish. But the rule of thumb is this: the fewer, the better. You can always switch up if a particular habit doesn’t work for you. From what I know of those who have signed up for this, you are all successful people. You know what you need to do to get where you need to go. Write out your top goals from Day 9 (no more than four key goals for the upcoming year). 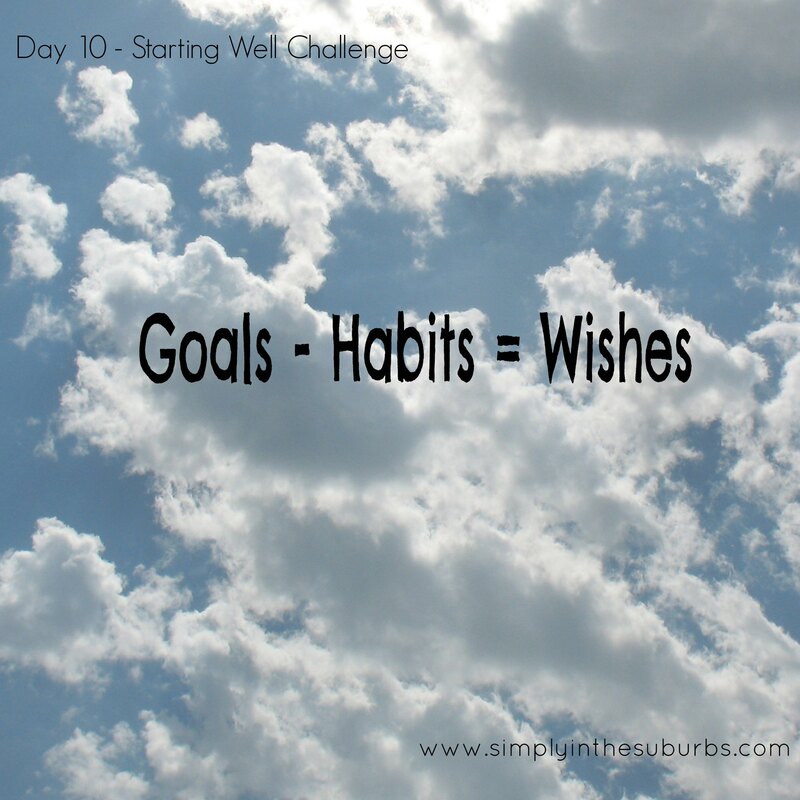 Write out the habit(s), practice(s), or steps that you need to take to achieve those goals or outcomes. Schedule them right now: Put them in your calendar. Slot them somewhere. Share your plan with your spouse or an accountability partner. We’ll talk more about the importance of the calendar and relationships later. In a nutshell: Pull out your goals and select habits to support them. Preview of Day 11: On Day 11, we’ll talk about setting yourself up with the best chance to be consistent with your new habits.